Honey Baby Darlin' is a multi-volume series that tracks the journey of a girl cook on a quest to create beauty, to nurture, to comfort and to please palates: to hear the sighs of the well-fed. The Gingerbread Farm is the newest instalment. The Gingerbread Farm is Farm #2 and the latest in the HBD Series. 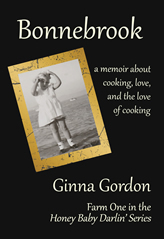 It explores the 60s and 70s: two decades of cooking adventures - from Glory's grandfather's farm in Ohio to the Gingerbread Farm on California's beautiful Carmel Coastline. The 320 page book includes 160 recipes and a few historical nuggets, both culinary and pop-cultural. 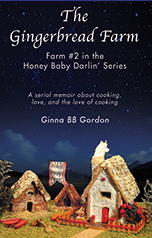 Book One – the Farm was the first volume in the Honey Baby Darlin' Series. 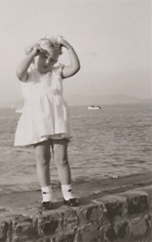 It covers an intense one-year period in the early fifties. Filled with tools, pantry, recipes, and culinary observations, it's a book for people who love food, cooking, beauty, a little history, and an early-1950s wartime romance. It is carefully tended for the details of creation, filled with the love of kitchen-craft, and stocked with 108 complete recipes. Gingerbread Farm created for the cover photo!